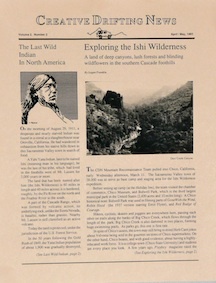 In today's Sept. 15, 2011 newsletter . . .
Are Kettlebells for Boomers and Seniors? I retired from publishing still a fairly young man. With my new-found freedom there were a few dreams I wanted to fulfill. One was to develop a cartoon strip for syndication. Another was to hike the length of the Pacific Crest Trail, which crosses mountain ranges beginning at the Canadian border and goes south all the way to Mexico. Neither goal was fulfilled exactly as I had imagined it would be. The cartoon strip morphed into painting and printmaking. Sections of the Pacific Crest Trail were enjoyed piecemeal on backpack trips. But that doesn't even come close to having completed the entire trek. Creative Drifting News, however, came to be as a result of my wandering and mountain trips. I had a 4-wheel drive Ford Bronco. I would load my gear into the vehicle and my dog Steve and I would follow back-country roads all over the western states and parts of Canada. Sometimes backpack trips of several days were included and sometimes just day hikes. After the hikes, I would look for a saloon or restaurant for dinner and a couple of beers. Discovering one with a jukebox with some Merle Haggard and Patsy Cline songs capped off my idea of a great day. Every month, I sent out notices to a few friends, inviting them to meet me at a trail-head for the next small adventure. I titled my notices "Creative Drifting News," where I would describe my previous adventures, hoping to whet their appetite. Sometimes it worked. When it did we always had a good time. If no one showed up, Steve and I would go alone. Creative Drifting News started getting passed around to friends of friends, and then to people I had never met. They began asking to get on my mailing list. The list grew and grew, along with the number of pages. I started charging for subscriptions. It was great fun that went on for a few years. But eventually I decided to cease publication. I was a one-man-show and the work became overwhelming. Ease of production was not as it is today. And I wanted to devote more time to painting and printmaking. What all of this has to do with fitness is that no matter what kind of exploration I was doing, I always managed to get in a workout. Of course hiking over high mountain passes is a workout in itself. Plus, in nearly any town, no matter how small, I could usually find a school or playground with rings or bars for chinning and pull-ups. By doing giant sets of pull-ups, sit-ups and push-ups the bases were covered. My motto was (and still is) that regardless of one's travel mode, there is rarely a reason to miss a workout. And after a day in the mountains, finding a jukebox and listening to Merle while enjoying a cool one is heaven. At least that's the way I saw things a couple of decades ago. Though my attitude is much the same today, I travel far, far less and my beer ration now is quite limited. I still love Merle and Patsy. And I still don't skip workouts. In the last newsletter (9/1/11), I tried to answer Don T's question about finding a perfect workout. I mentioned that after age 50 certain kinds of training may put too much stress on aging tendons and ligaments. By that I meant there comes a time when it is smart to stop doing heavy, all-out, maximum effort lifting. I suggested a few alternatives, such as doing higher reps with more manageable weights, and so forth. I said that in some cases resistance bands, bodyweight exercises, or kettlebells are good options to try if barbell lifting itself may be a part of the reason for achy joints. A couple of subscribers said I was on the right track but took me to task regarding the kettlebells. The dynamic, even explosive, nature of many kettlebell lifts make them riskier than lifting barbells and dumbbells, they said. Well, I should clarify a few points. First, if you don't have any joint aches and pains and you like lifting standard barbells, there is no reason to stop. I like dumbbells and barbells, too, and have always used them. However, as we grow older, lighter weights and higher reps, or maybe the super-slow reps method of training, can be a smart thing to do. You have to adjust. Years ago, bench pressing caused my shoulders to ache, so I replaced the bench press with a variety of push-ups. Knock on wood, I don't have any joint pain today. However, I know plenty of boomers and seniors who do. Some stubbornly continue the kind of heavy work that aggravates aging joints. Old habits can be hard to break. My suggestion always is to try other resistance methods that may provide relief while still delivering the results we all want. So back to the question of whether kettlebells should be on a list of senior friendly training methods: I say, yes, they should. 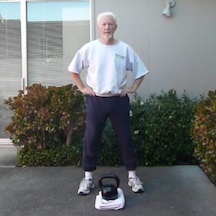 Kettlebells, used properly, are appropriate for boomers and seniors, or for trainees at any other age. Next month I will turn 75. Seventy-five is very senior. The short video made this week shows me doing a one-and-a-quarter-minute kettlebell set (to see the video, click on the photo). As you will see, kettlebell lifting tends to be full body challenging and dynamic. So it is smart to get some good coaching or buy a good instruction video. But once you know the basics, kettlebells are no riskier than other kinds of weight training. In my case, I like workout variety and sometimes mix dumbbells, resistance bands, bodyweight calisthenics, and kettlebells in a single session. I have not experienced one bit of joint soreness from kettlebell lifting and, no question about it, they are fun to work with. Just get some instruction, use good judgment, and you will be fine.